The witness said he was the Zenith Bank Plc, Akure, Branch manager in 2014 when the N1.2billion was allegedly moved to his branch. 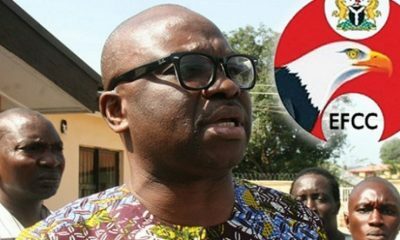 Fayose is currently standing trial alongside a company, Sportless Investment, before the Federal High Court, Lagos. The duo, however, pleaded not guilty to the charge bordering on fraud and money laundering slammed on them by the Economic and Financial Crimes Commission (EFCC). Led in evidence by prosecuting counsel, Mr Rotimi Jacobs (SAN), the witness said he got a call from his head of operations asking him to prepare to head for Akure Airport to receive huge cash from a customer. “On the 17th of June 2014, I was in my office in Zenith Bank, Akure when I received a call from my head of operations, Abiodun Oshodi, that a customer would be coming to make a deposit into his account with the bank. “He said we should prepare to go to the airport. I asked for time to arrange for security, but they said that won’t be necessary as they had sufficient security. They came with Mopol and some soldiers in a Toyota Hilux van,” Alade said. Under cross-examination by defence counsel Ola Olanipekun (SAN), and Olalekan Ojo (SAN), the witness said he was not aware of where the money came from. The trial continues on May 10 and 14 at 10 am.